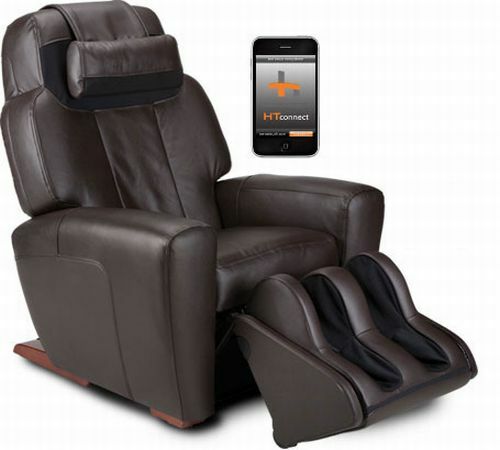 Human Touch has introduced a new massage chair that can be controlled via a Bluetooth connection on an iPhone or iPod Touch. The iPhone can be used to personalise the chair to give the massage you want. With the bluetooth connection and an application you can access a variety of different programs for the chair. HT-Connect¢ can be connected via Bluetooth connection on an iPhone or iPod touch to instantly access a wealth of massage programs, expertise and user-friendly applications. Priced at $5999, the HT-Connect¢ will be available this June through leading retailers or at Human Touch. It’s an expensive chair and an expensive way to control what essentially a few controls on the side of the chair could do, but of course it’s the type of gadget we expect to see at Born Rich!